Visitors to the Flynndog gallery’s current exhibition, “Fluid Dynamics,” are greeted by a labyrinthine tower of copper pipes supporting a urinal 10 feet high. Beside the sculpture, a broken pogo stick leans against a wall. It’s hard not to think of French Dadaist Marcel Duchamp and the displaced porcelain he left us as a kind of art-historical inheritance. When Chris Cleary made his towering latrine, he says, he was not familiar with Duchamp’s ready-made 1917 sculpture, “Fountain.” Yet Cleary’s looming loo strikes a similar tone in form and intent to Duchamp’s legendary john, both unseating the sacredness of art objects and poking fun at the seriousness of the art world that enshrines them. Cleary, who has a wiry build, longish red hair and a quick smile, lends animation to the cozy garage-turned-studio in Jericho where he runs his stonework business and creates fine-art sculptures. The 36-year-old is a self-professed “reclusive-artist type” who says he “shoots out of bed in the morning and into the shop” to make his work. Cleary speaks often and fondly of his wife, Kim, and two kids, citing Kim’s patience with his thirst for materials. (He used the siding from the back of their house to build a pyrotechnic sculpture last summer.) He also credits his children’s Dr. Seuss books with influencing his pipe sculptures. Last winter, Cleary sold his carved-slate Christmas-tree ornaments through Vermont Life magazine, giving himself more hours to spend in the studio rather than hawking his wares at craft and trade shows. 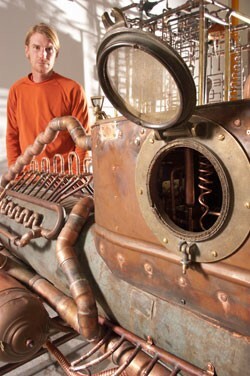 The surplus time enabled him to finish the four large-scale, copper-pipe sculptures on display at the Flynndog. The pieces were four years in development, material accumulation and construction, and their current presentation as a strong, cohesive group is strategic. “I wanted people to take these seriously, and also to be associated with other artists,” he says. When mentor and friend Homer Wells invited him to participate in the Flynndog show, Cleary says he was honored. A stone sculptor by training and vocation, Cleary calls his copper work “a love affair gone right.” He seems fascinated with the materiality of copper and its duality as a building material and semiprecious metal, not to mention its aged appearance. The artist refers to his work as “steampunk,” after the mechanical, nouveau-Victorian aesthetic. Many of Cleary’s works are inspired by found copper and brass pieces. He sources his copper pipes and fittings and brass ornaments, parts and embellishments from a scrap yard he coyly refuses to name. Cleary also barters with various scrap purveyors and friends who bring him metal oddities. Coils, knobs and strangely shaped fittings cluster in crates around his studio like plundered treasure. “I like being the last owner, the last user of something,” he says. Cleary buys many of his parts new from local suppliers, too. When he finished his submarine-like sculpture “Neptune,” he and a friend stopped by one of those suppliers on the way to deliver the piece, hoping to procure the final brass bolt for its nose cone. The store staff filed outside to marvel at Cleary’s submarine, which recalls both Captain Nemo’s Nautilus and a Smithsonian Museum artifact. “I’ve got the perfect bolt for that,” an older man told Cleary, then disappeared into the depths of the store and emerged with a single, shining brass bolt. “No charge, just send me a picture,” the supplier said. “The arts bring that out in people,” Cleary says with a smile. The experience gave him both sturdy construction and a newfound affection for the copper pipes he’d learned to solder with silver. From this work emerged the pipe sculptures. Cleary leaves the “sweated” joints messy and visible. He likes the irony that the pipes’ solid seals appear to be leaking. Wry humor pervades all of Cleary’s works at the Flynndog, including an ominously one-legged jet pack and a shower stall composed of a Rube Goldbergian screen of copper pipes. Cleary received formal stone-carving training during a residency at West Rutland’s Carving Studio & Sculpture Center in 2007, but is otherwise a self-taught sculptor. His works encompass large-scale wooden, pyrotechnic sculptures; lettered and pictorialized stones; stone-and-copper “cattail” sculptures that move in the wind; and the recent copper-pipe constructions. Though diverse, his oeuvre is unified by his love for the alchemy that occurs when a sculptor puts hand to material. In Cleary’s backyard, perennials sleep under a blanket of snow that also coats the odd planes of his stone and metal sculptures. A zip line links a spirelike wooden structure with the woods beyond. Old stone farm walls ramble off into the distance. The place reflects this artist’s mind: a landscape of joyful ideas and inventions and anticipation. And, of course, good humor.